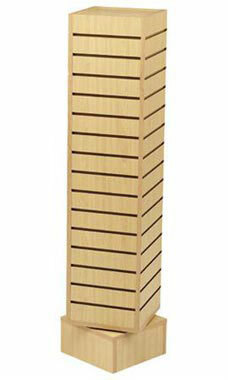 The 12" Rotating Maple Slatwall Tower w/Base and Casters is the best choice for your retail sales floor. The ease and versatility of the unit makes it ideal for simple floor moves. This unit features a strong MDF (Medium Density Fiberboard) covered in melamine laminate finish. Each unit has display capability on all four sides. The unit can be placed anywhere on the sales floor. The unit can be assembled by hand in less than one hour. Additional features include a sturdy square base with casters to complete the look of your unit. The base stays stationary while the slatwall unit rotates 360 degrees. Accessorize with any of our slatwall peghooks and other display accessories sold separately.